Italian painter and draughtsman (entire name: Giuliano di Piero di Simone Bugiardini). He trained in Florence in the workshop of Domenico Ghirlandaio. The influence of Ghirlandaio is apparent in his earliest known works, datable between c. 1495 and 1500, which include part of the altarpiece of the Nativity (Florence, Santa Croce) painted for the Castellani family. 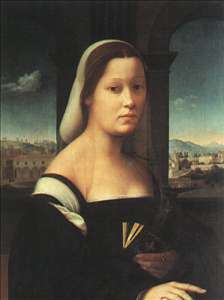 Apart from Ghirlandaio, his two most important early influences were Fra Bartolommeo and Mariotto Albertinelli. In 1503 Bugiardini joined the Compagnia di S Luca and began an association with Albertinelli that continued until 1509 when Albertinelli moved to the workshop of Fra Bartolommeo. Bugiardini s paintings of the Virgin and Child (e.g. c. 1510; Kansas City, MO, Nelson-Atkins Museum of Art) show the influence of the balanced classical compositions executed by Raphael in Florence between 1504 and 1508 (e.g. 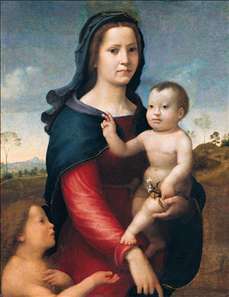 the Madonna del Prato, Vienna, Kunsthistorisches Museum; La Belle Jardiniere, Paris, Louvre). From Ghirlandaio s workshop and his study of antique sculpture in the Medici garden, Bugiardini would have known Michelangelo early in his career. Vasari mentioned Bugiardini as among the artists who went to Rome in 1508 to assist Michelangelo with the painting of the ceiling of the Sistine Chapel (Vatican) and who were almost immediately sent back to Florence. The influence of Franciabigio is clear in such works as the Birth of John the Baptist (1512; Stockholm, Universty, Kunstsammlung; autograph copy, Modena, Galleria & Museo Estense) in which nature is not idealized, as compared to contemporary works in Rome. 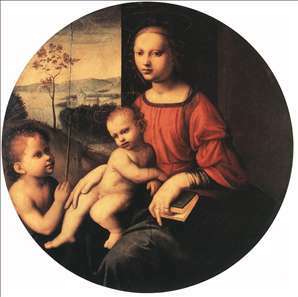 The signed and dated Madonna della palma (Virgin and Child with the Infant John the Baptist, 1520; Florence, Uffizi) suggests his familiarity with such contemporary Roman paintings by Raphael and his workshop as the Madonna of Divine Love (Naples, Capodimonte) or the Madonna of the Rose (c. 1518; Madrid, Prado). 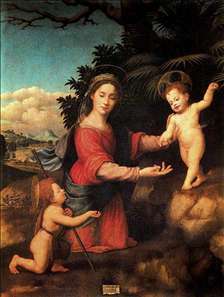 The development of Bugiardini s mature style continued in the 1520s with such ambitious compositions as the Virgin and Child with the Infant John the Baptist (c. 1522; Leipzig, Museum der bildenden Knste). See more details about "The Madonna and Child with the Infant St John the Baptist"
See more details about "Portrait of a Woman, called "The Nun""
See more details about "Virgin and Child with the Infant St John the Baptist"